Did you know that Labor Day was created in the 1800's by the labor movement to honor the social and economic achievements of the American worker...achievements which have added to the strength and prosperity of our country? Over the years, increased emphasis was placed on the new holiday; and on June 28, 1894, Congress declared the first Monday in September to be a legal holiday. 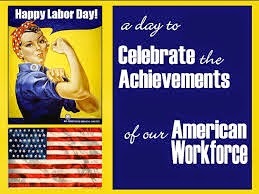 Early Labor Days consisted of a parade followed by a festival for the enjoyment of workers and their families. This tradition holds true today as families gather together to enjoy the three-day weekend. Although many of us may take it for granted, this year, pause to reflect and honor the American Labor Force and the part we have all played in making American great.